I went to Theater Latte Da's production of Song of Extinction at the Guthrie' Dowling Studio, expecting to see great drama. But what I didn't expect is that for a few moments, the drama in the audience overshadowed the drama on stage! About ten minutes into the show I could hear people talking behind me. My first thought was, "how rude, to talk out loud at the theater!" But then I realized they were saying "we need medical attention," and, as you usually only hear on TV, "is there a doctor in the house?" Within seconds the house lights came up, the action on stage stopped, and the ushers and numerous other important looking people rushed in, while we were told to "remain calm and in your seats." A woman had passed out in her seat, but regained concsiousness before the paramedics arrived. After a few minutes the actors went backstage, and the stunned silence in the audience turned to chatter as we waited for the paramedics. The woman was taken out in a wheelchair and is hopefully OK. The scene was reset, the lights went out, and we rewound to the beginning of the scene that was interrupted. On with the show. I have to admit, the excitement totally took me out of the play. But fortunately it was near the beginning and I was soon able to get back into the world that was just beginning to be created in front of us. Theater Latte Da usually does musicals, but they occasionally do what they call "a play with music." This is one of those times. 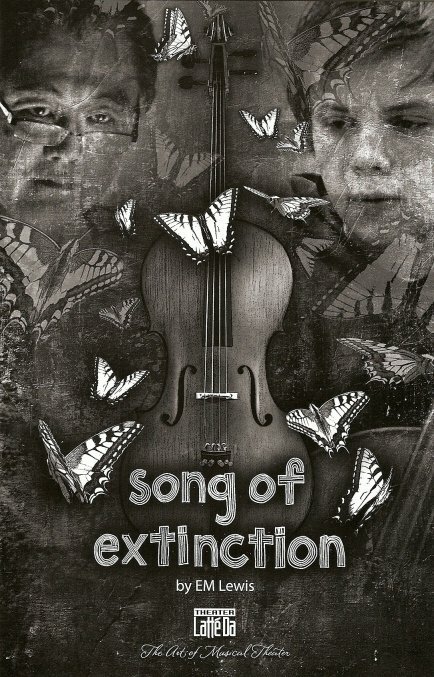 Song of Extinction, directed by Artistic Director Peter Rothstein, is a new play by EM Lewis about science and life and death and relationships and music. Max is a 15-year-old boy (played by high school junior Dan Piering, an impressive actor and musician) whose mother (Carla Noack) is dying of cancer and trying to protect her son as best she can. Max's biologist father (John Middleton) seems to care more about a species of bug he discovered in Bolivia than what's happening with his family. Faced with losing his wife and his life's work, he chooses to focus on the one that he might have some control over. Max has no one to turn to, other than his music (he carries his cello in its battered case like a security blanket) and his science teacher, a Cambodian refugee who was the only member of his family to survive the Khmer Rouge. Mr. Phan (David Mura) understands death and loss and is reluctantly drawn into being there for Max and his family when no one else can. The theme of extinction runs through the play on several levels. Max's father's species of bug only exists in a Bolivian rain forest that's about to be destroyed. He desperately pleads his case to the businessman in charge, telling him that we don't know what the effects of the loss of one species are. Mr. Phan's whole family became extinct, and as a science teacher he also teaches his students about extinction. He assigns them a twenty page paper, and when Max is too frightened to be either at the hospital with his mother or at home with his father, he goes to Mr. Phan for help on the paper. An angry Max asks, "why shouldn't I blow up the school if we're all going to die anyway?" Mr. Phan calmly gets him to explore the idea in terms of the paper, but he sees that there's more going on, and gets Max to confide in him. When Max finally turns in his paper after his mother's death, it's a story about his dad the biologist, and his mom's death, and ends with a song he wrote for the cello (an original piece composed by Latte Da Musical Director Denise Prosek). The play ends with Max playing his "song of extinction" and pouring all of his feeling into the music. The set design by Michael Hoover is really interesting and effective. The main focus is a hospital bed surrounded by see-through walls with panels in them that also function as screens. Old fashioned slide projectors are lined up at the front of the stage and project different designs and colors, as well as pictures of bugs, around the stage. 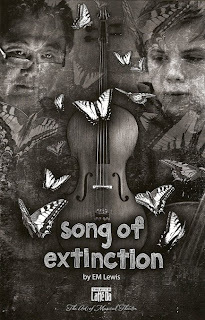 Song of Extinction is another great piece by Theater Latte Da that, while not a traditional musical, explores the place that music has in our lives.